When seen through cybernetics glasses, enterprises are social entities whose sustainability and capabilities hang on their ability to track changes in their environment and exploit opportunities before their competitors. As a corollary, corporate governance is to be contingent on fast, accurate and purpose-driven reading of environments on one hand, effective use of assets on the other hand. And that will depend on enterprises’ capacity to capture data, process it into information, and translate information into knowledge supporting decision-making. Since that capacity is itself determined by architectures, a changing and competitive environment will require continuous adaptation of enterprises’ organization. That’s when disorder and confusion may increase: lest a robust and flexible organization can absorb and consolidate changes, variety will progressively clog the systems with specific information associated with local adjustments. Whatever its type, effective corporate governance depends on timely and accurate information about the actual state of assets and environments. Hence the need to assess such capabilities independently of the type of governance structure that has to be supported, and of any specific business context. Effective governance is contingent on the distance between actual state of assets and environment on one hand, relevant information on the other hand. How to identify the relevant facts and monitor them as accurately and timely as required. 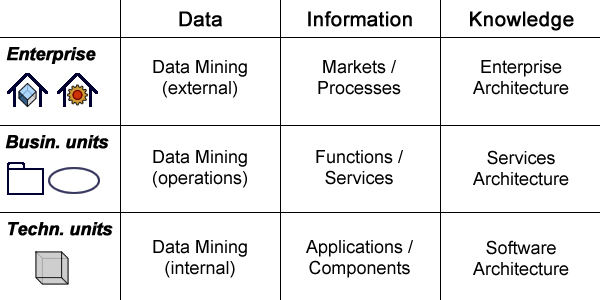 How to process external data from environment into information, and to consolidate the outcome with information related to enterprise objectives and internal states. How to put the consolidated information to use as knowledge supporting decision-making. 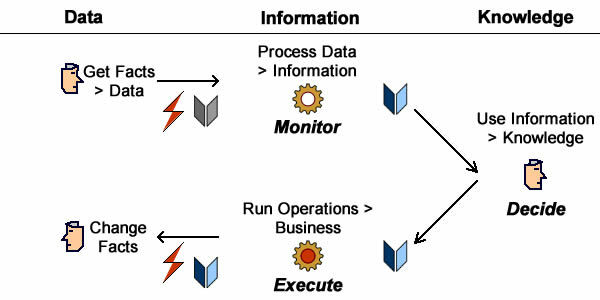 How to monitor processes execution and deal with relevant feedback data. What is behind enterprise ability to track changes in environment and exploit opportunities. Enterprises being complex social constructs, those tasks can only be carried on through structured organization and communication mechanisms supporting the processing of information flows. Assuming that enterprise governance relies on accurate and timely information with regard to internal states and external environments, the first step would be to distinguish between the descriptions of actual contexts on one hand, of symbolic representation on the other hand. Enterprise architectures can be described along two dimensions: nature (actual or symbolic), and target (objects or activities). Even for that simplified architecture, assessing variety and information processing capabilities in absolute terms would clearly be a challenge. But assessing variations should be both easier and more directly useful. Operational changes are occurring, and can be dealt with, within the time-frame of processes execution. Structural changes affect contexts and assets and cannot be dealt with at process level as they. From actual to symbolic: how changes in environments are taken into account; how processes execution and state of assets are monitored. 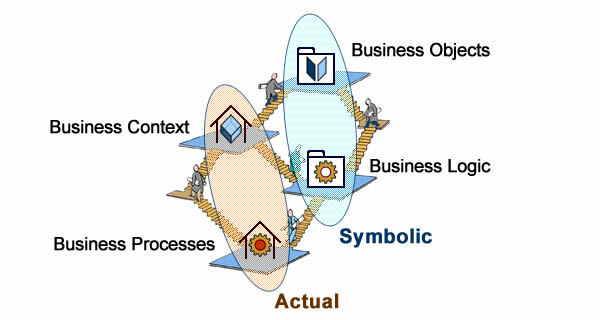 From symbolic to actual: how changes in business models and processes design are implemented. The effects of those changes on overall governance capability will depend on their source (internal or external) and modality (planned or not). As far as enterprise governance is considered, changes can be classified with regard to their source and modality. Changes within the enterprise are directly meaningful (data>information), purpose-driven (information>knowledge), and supposedly manageable. Changes in environment are not under control, they may need interpretation (data<?>information), and their consequences or use are to be explored (information<?>knowledge). 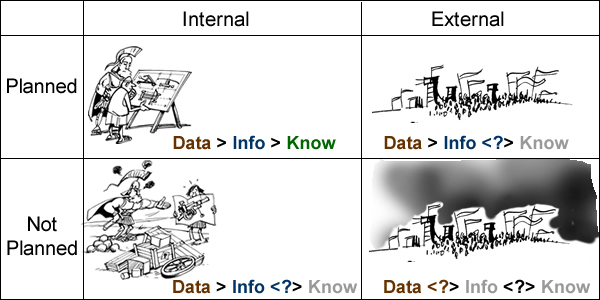 Data associated with unplanned internal changes can be directly interpreted (data>information) but their consequences have to be analyzed (information<?>knowledge); data associated with unplanned external changes must be interpreted (data<?>information). Changes can be classified with regard to their source (enterprise or environment) and modality (planned or not). Changes occurring within planned configurations are meant to be dealt with, directly (when stemming from within enterprise), or through enterprise adjustments (when set in its environment). That assumption cannot be made for changes occurring outside planned configurations because the associated data will have to be interpreted and consequences identified prior to any decision. Enterprise governance will therefore depend on the way those changes are taken into account, and in particular on the capability of enterprise architectures to process the flows of associated data into information, and to use it to deal with variety. Originally defined by thermodynamic as a measure of heat dissipation, the concept of entropy has been taken over by cybernetics as a measure of the (supposedly negative) variation in the value of information supporting corporate governance. As noted above, the key challenge is to manage the relevancy and timely interpretation and use of the data, in particular when new data cannot be mapped into predefined semantic frame, as may happen with unplanned changes in contexts. How that can be achieved will depend on the processing of data and its consolidation into information as carried on at enterprise level or by business and technical units. Given that data is captured at the periphery of systems, one may assume that the monitoring of operations performed by business and technical units are not to be significantly affected by architectures. The same assumption can be made for market research meant to be carried on at enterprise level. Within that working assumption, the focus is to be put on enterprise architecture capability to “read” environments (from data to information), as well as to “update” itself (putting information to use as knowledge). At technical level traceability between components and applications is required if changes in business operations are to be mapped to IT architecture. At organizational level, the critical factor for governance will be the ability to adapt the functionalities of supporting systems to changes in business processes. And that will be significantly enhanced if both can be mapped to shared functional concepts. Once the “readings” of external changes are properly interpreted with regard to internal assets and objectives, enterprise governance will have to decide if changes can be dealt with by the current architecture or if it has to be modified. Assuming that change management is an intrinsic part of enterprise governance, “updating” capabilities will rely on a continuous, comprehensive and consistent management of information, best achieved through models, as epitomized by the Model Driven Architecture (MDA) framework. At technical level platform specific models (PSMs) provide for applications and components traceability. They support maintenance and configuration management and can be combined with design patterns to build modular software architecture from reusable components. At organizational level, platform independent models (PIMs) are used to align business processes with systems functionalities. 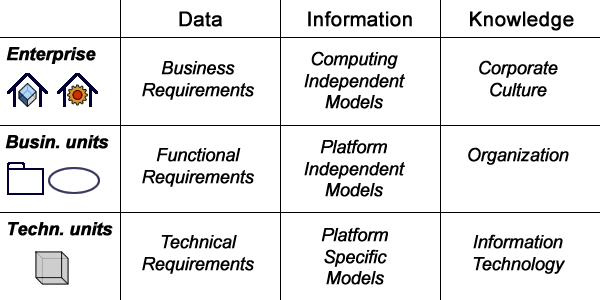 Combined with functional patterns the objective is to use service oriented architectures as a level of indirection between organization and information technology. 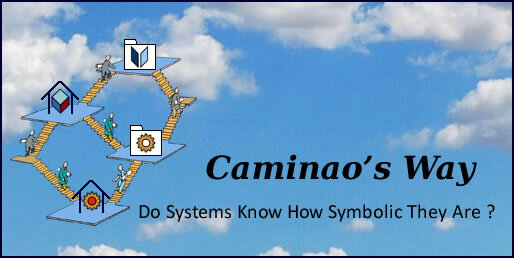 At enterprise level, computation independent models (CIMs) are meant to bring together corporate tangible and intangible assets. That’s where corporate culture will drive architectural changes from systems legacy, environment challenges, and planned designs. Faced with continuous changes in their business environment and competition, enterprises have to navigate between rocks of rigidity and whirlpools of variety, the former policies trying to carry on with existing architectures, the latter adding as many variants as seems to appear to business objects, processes, or channels. Meeting environments challenges while warding off growing complexity will depend on the plasticity and versatility of architectures, more precisely on their ability to “digest” the variety of data and transform it into corporate knowledge. Along that perspective enterprise architecture can be seen as a natural antidote to entropy, like a corporate cousin of Maxwell’s demon, standing at enterprise gates and allowing changes in a way that would decrease internal complexity relative to the external one. I don’t say that knowledge is architecture, only that part of architecture is knowledge. Besides, when you write that “Architecture is a conceptual approach …” you’re not far from my own line of thinking. Hi, I absolutely disagree. Knowledge IS NOT architecture. Knowledge is gathered experience how to achieve a state space transformation as per a defined goal. Architecture is a conceptual approach to create a space or forms that enable functions. Architecture has to provide freedom to the knowledge bearer and gatherer. Entropy is a measure of how well ordered a system is. An increase Entropy is a requirement for gathering knowledge because the destruction of previous order is a requirement to allow for change. So if you see architecture as an antidote to entropy then you see it as an antidote to change and this is the part that I absolutely agree with. You conflict with the need of systems to adapt. Adaption happens from the inside and not from an outside governance and control perspective driven by architecture.